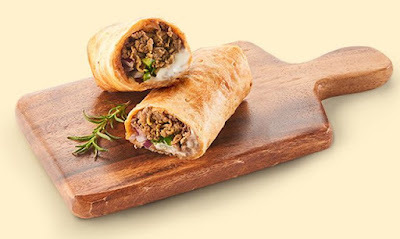 Calling them "Pizza Wraps," Domino's is baking new burritos over in South Korea. Pizza Wraps come in two varieties: Double Cheese Wagyu and Pulled Chicken. The Double Cheese Wagyu features a rolled up wrap filled with wagyu beef, bacon, red onion, green pepper, arrabiata sauce, Romano, cream cheese, mozzarella cheese, and brie cheese sauce. The Pulled Chicken comes filled with pulled chicken, bechamel cream sauce, raclette cheese sauce, mozzarella cheese, red onion, and green pepper. Both wraps/burritos are selling for 4800 won (~$4.48 US) a piece.